The Philly Unity Cup kicks off tonight, setting into motion a sporting event unlike any in America. The event, now in its second year, brings together 48 teams representing immigrant communities throughout the city. Teams will face off at fields throughout the city over the next several weeks, with the final taking place at Lincoln Financial Field on Nov. 11. Last year’s champs, Ivory Coast, will look to defend their title against teams representing countries as wide-ranging as Ukraine, Thailand, Ghana, Brazil and Mexico. Some of these immigrant communities are well-known in the region. Others — not so much. Philadelphia Mayor Jim Kenney dreamed up the event, which began play last year and has become a notable counterpoint to nativist, anti-immigrant political rhetoric. The tourney costs an estimated $80,000 to $100,000 for the city government to operate, but Salvatore said all funding comes from sponsors such as Philadelphia Union, Goya, the Eastern Pennsylvania Youth Soccer Association, and the Casa Soccer League. Additionally, volunteers comprise a good part of the labor supporting it, joining city staff. With continued sponsor backing, there are hopes the tournament could become a fixture in Philadelphia. Teams form in different fashions. Some, such as the Ukrainians, draw from long-established club teams that date back to the region’s early soccer days, when many clubs formed from ethnic organizations. Some will play their first games together during this tourney. Then you have the Mexican club, which was put together by the Mexican Consulate in Philadelphia. There are a few exceptions to the premise of immigrant communities. For example, there will be an American team and a Puerto Rican team. More notably, there will be a refugee team comprised of immigrants from nine countries, including Iraq, Syria, Cuba, Afghanistan, and the Democratic Republic of the Congo. The team, organized by the Nationalities Services Center, includes players who arrived in the U.S. on Special Immigrant Visas, which are given to refugees whose service with U.S. military forces overseas put their lives in danger and required them to flee their native countries. The tourney’s first games are tonight at Ramp Playground in northeast Philadelphia, with Indonesia playing Puerto Rico at 6:30, followed by Ukraine-Brazil at 8:30. Another 22 games will follow this weekend, most of which are on Sunday. 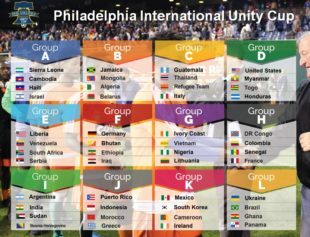 The full schedule is available at http://unitycup.phila.gov. The tourney will mostly follow standard FIFA rules, with a few exceptions, such as freer substitutions. Teams have been drawn into 12 groups of four during the group stage before transitioning to a knockout-style tournament, much like the World Cup. For more details on the tournament, including a full schedule and field locations, see http://unitycup.phila.gov. All games are free to the public.